The Hospitals of Providence Children’s Hospital is actively seeking a Pediatric Ophthalmologist to join an outstanding practice in El Paso, TX. This is a tremendous opportunity as this is the only practice in the region that does 100% Pediatric Ophthalmology. Office hours are Monday-Friday, regular business hours with the option of Saturday clinic as well. State-of-the-art office with a fully computerized EMR system and has a highly-trained staff of eye techs and scribes to fully document each exam. Partnership track available. Ideal candidates will be fellowship-trained in Pediatric Ophthalmology; however, General Medical Ophthalmology candidates that have a strong interest in Pediatrics will be considered as well. Candidates must be BE/BC with an active Texas license (or in progress). If interested, please submit your current CV for immediate consideration. All inquiries are kept strictly confidential. The mission of The Hospitals of Providence Children's Hospital is to provide quality pediatric services in a caring, progressive environment. The Hospitals of Providence Children's Hospital contains 148 beds and is committed to quality through teamwork, technology and service in a child friendly, family oriented environment. As a member of The Hospitals of Providence in El Paso, Texas, The Hospitals of Providence Children's Hospital continues its commitment to the children in our community and region; improving the full scope of pediatric care in El Paso. Offering the latest pediatric technologies, The Hospitals of Providence Children's Hospital seeks to maximize opportunities for positive outcomes through innovative treatment approaches developed specifically for children. The Hospitals of Providence Children's Hospital serves the pediatric component of the approximately 750,000 people of El Paso, Texas and the surrounding area. The Hospitals of Providence Children's Hospital sees more pediatric patients than any other hospital in the Region. Being on the United States/Mexico border, there are also pediatric patients from Mexico who are treated at the facility. 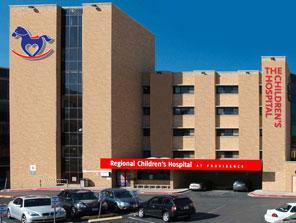 The Hospitals of Providence Children's Hospital staff also receives specialized training in the treatment of children. Many members of the nursing staff have received Pediatric Advanced Life Support (PALs) and/or Neonatal Resuscitation Program (NRP) certification. These health professionals are part of a team that includes pediatric sub-specialists in cardiology, genetics, infectious diseases, ophthalmology, orthopedics, pathology, radiology, urology, nephrology, pulmonology, surgery, oncology, hematology, neurology, endocrinology, gastroenterology and neonatology.